Cycling round Lake Constance from Arbon to Stein am Rhein. Day Two saw us setting off with depleted in numbers. Mr CW has fallen of his bicycle and broken his elbow. The Swiss doctors have taken great care of him but he his now unable to cycle and is to complete today’s journey by train. As the bike path follows both the lake edge and the railway, we will meet him at various stops en-route. Time for a few Lake Constance facts and figures: 46 km long and 14 km wide it is really just a very large bulge in the River Rhine, 76% of its water comes from the Rhine where it flows in just outside Bregrenz. It takes three months for the water to flow from one end to the other. Three countries border the Lake (Austria, Switzerland and Germany) and its shores have been occupied since the Bronze Age. Rumour has it that you can see the distant Alps from the Western end of the Lake but cloud kept visibility to a minimum when we started our journey – I’m sure it will be different at the end. Our next station stop was Kreuzlingen, a busy border town with a harbour buzzing with boats that ply their way around the Lake. We found Mr CW and ate our picnic overlooking the harbour with a Zeppelin hovering overhead. Zeppelins were invented in Freidrichshafen on the opposite shore and have a museum dedicated to them, a visit is on my list. Our afternoon journey took us through peaceful vegetable farms and pretty half-timbered villages to our final rendezvous with Mr CW at the outrageously pretty Steckborn, which has a particularly beautiful view of the Lake. 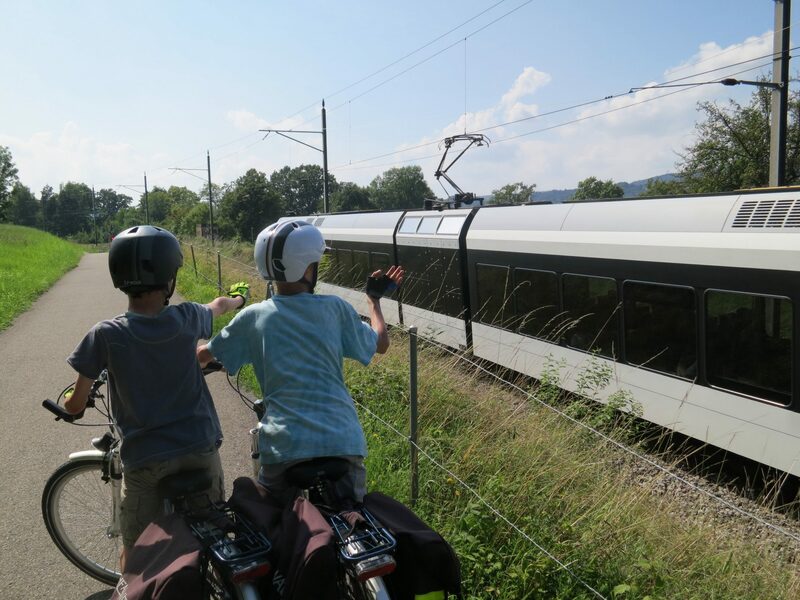 Here we offered the Junior CW’s the chance to put their bikes on the train and shorten their journey by 12 km but they chose to pedal on and completed the full 52 km set out in our schedule. Stein-am-Rhein, today’s destination, is where the lake officially becomes a river once again. It is a place of chocolate-box perfection. Half-timbered and painted buildings lean over each other and appropriately the main square is lined with shops selling stunningly expensive chocolates. We are staying in the Hotel Rheinfels housed in a four hundred year old riverside building, August 1st is Swiss National Day and so this evening we will have ringside seats for the big firework display. 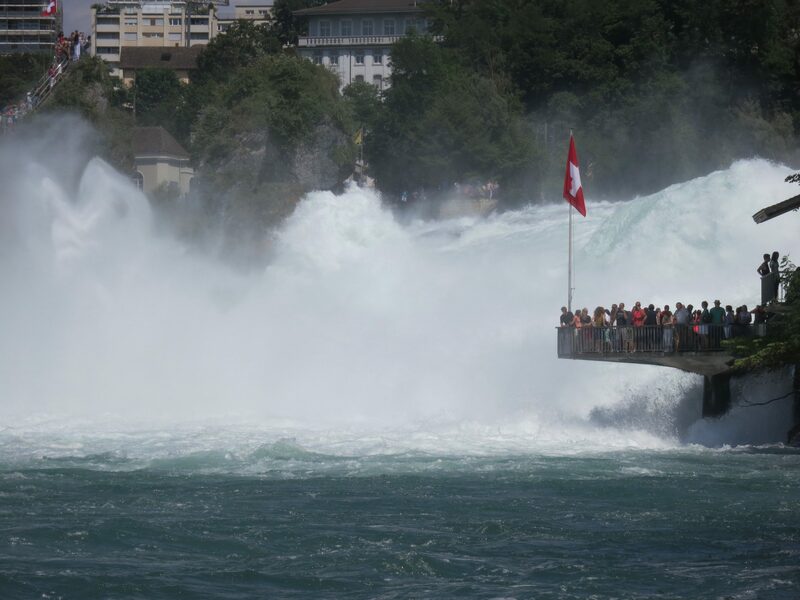 On our rest day we chose to leave our bicycles safely locked up and took the train down the Rhine to Schaffhausen and the Rhine Falls which are the biggest waterfalls in Europe. First of all we took a brisk 4 km walk along the southern shore of the Rhine and from this side you can view the falls for free. If you cross the bridge to Schloss Laufen you need to pay CHF 5.00 for a decent view but you do get close enough to get wet. We chose to take a boat across the base of the falls for a princely CHF 4.00 per person and then to catch the train back into Schaffhausen and hence back to Stein-am-Rhein. 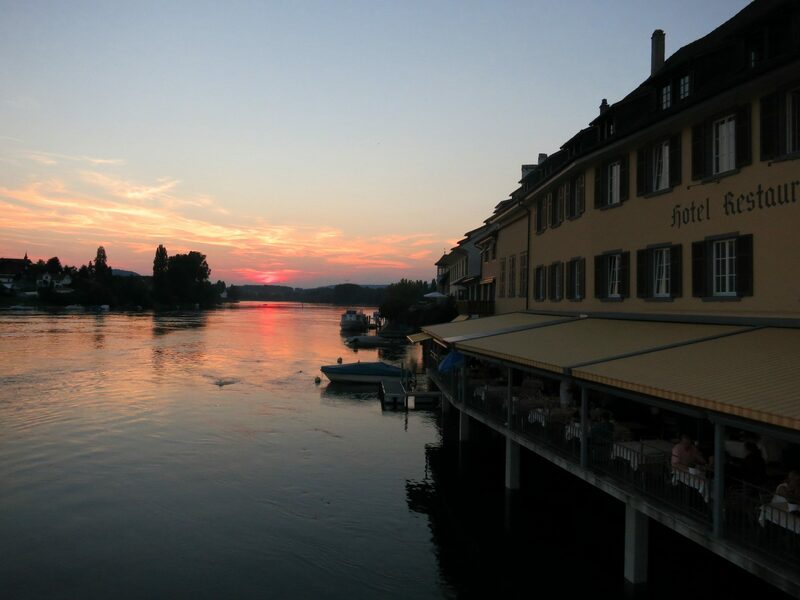 My oldest son wrote his own post about our journey round the whole of Lake Constance click here to read a 10 years view. DISCLOSURE: When we booked this holiday and others with Headwater, we did so because we felt that they were the best on offer for our family, since then I have become an affiliate with Headwater and will receive a small payment for any holiday booked as a result of referral from this post.